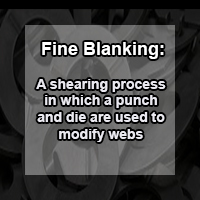 We recently had the opportunity to work with a large manufacturer and supplier of stamped and fine-blanked components. Predominantly known for their manufacturing of automotive parts, they provide a large variety of industrial equipment for several industries around the world, including Agriculture, Marine, Motorcycle, Wind & Solar Energy, Batteries and more. The process engineer, at one of their U.S. facilities, contacted us with questions about providing possible cooling solutions for their automotive line. They were working with type 409 stainless-steel, which was being robotically welded together, but before these parts could move on to the next stage of production, end forming and leak testing, they needed to be cooled. The manufacturer needed to cool the 3-1/4” x 8” parts, weighing 2lbs, from over 500°F down to 100°F. If these metal parts weren’t cooled fast enough, or cooled to a low enough temperature, the extremely hot parts could damage the sizing tool and leak testing machines during the following stage of production. After the hot parts were robotically welded they were placed on a conveyor that advanced into a “cooling cell”. In an attempt to quickly cool the steel parts, the process engineer had installed fans in the “cooling cell” that blew air on the parts for 25 seconds. Utilizing temperature monitors and sensors, they were able to tell if the part was cooled down to 100°F after going through the fan operated “cooling cell”. If the part exceeded 100°F they were automatically rejected and pulled off-line until they could cool further. Needless to say, the fans were providing insufficient cooling and creating a huge bottleneck in production. After going through the production process with our application engineer, we were able to calculate the cooling capacity required to cool the stainless-steel parts in under 25 seconds. 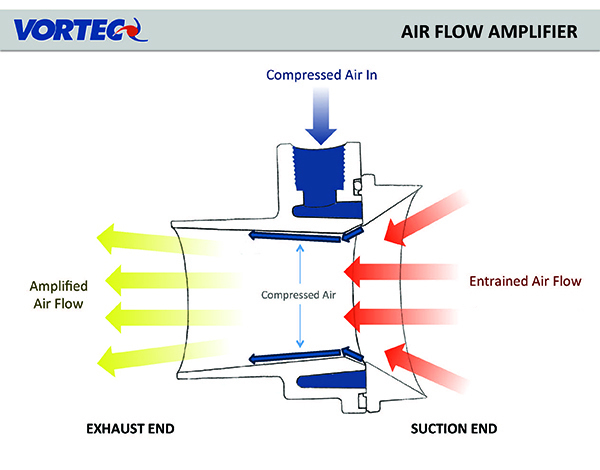 The Vortec application engineer recommended that they install Air Flow Amplifiers. The Air Flow Amplifiers would allow for a large volume of high velocity, ambient air to be blown on to the parts. This high velocity of air would quickly cool the parts allowing them to proceed to the next stage of production. The Vortec application engineer recommended that it would take four of Vortec’s 903 Air Flow Amplifiers to cool the parts down to 100°F in under 25 seconds. The process engineer replaced the fans with two Air Flow Amplifiers and they immediately noticed a huge improvement in the production output. The manufacturer no longer had to take the parts off-line and wait for them to cool down to 100°F. This switch was able to save the company in downtime, maintenance cost and headaches. After seeing how effective the two 903 Air Flow Amplifiers were, the process engineer is installing two additional Air Flow Amplifiers to further improve cooling time and hopefully speed up production. Air Flow Amplifiers work due to the Coanda Effect. This is a phenomenon in which a jet flow attaches itself to a nearby surface, but what makes it unique is as the surface curves the air flow remains attached to the curved surface even as it curves away from the jet flow. This is what allows Air Flow Amplifiers to significantly increase air flow. The compressed air is combined with ambient air and pulled into the air amplifier piece. As the compressed air combines with the ambient air it becomes “mixed air” which now has a much higher velocity and force than before. This is why Air Flow Amplifiers require a small amount of compressed air and can still produce a significant increase in air flow. The Coanda Effect is the same phenomenon that allows airplanes to create the lift necessary to take off. See how Air Flow Amplifiers work in action by clicking here.